If you have any questions or want to enquire about dates, use our form to contact Roberto & Nikki or see their website for more information. 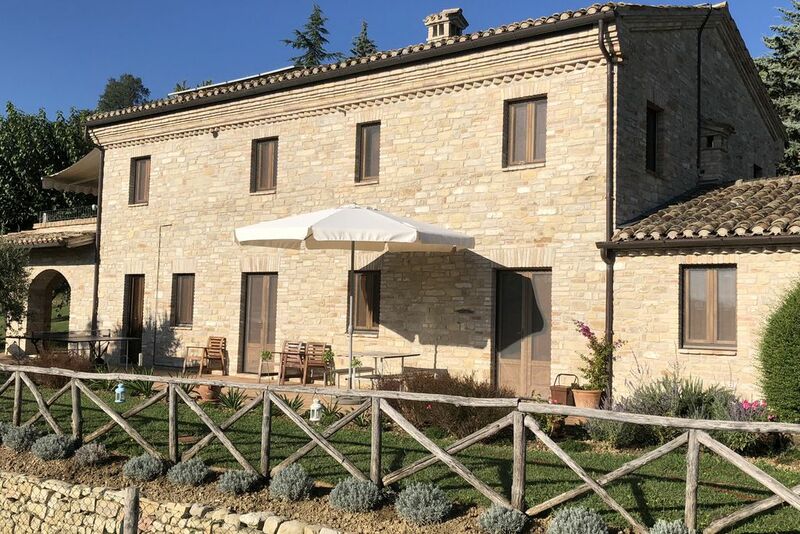 Down the steep winding road from Montelparo – with a thrilling final lap to the house – is a haven of birdsong and tranquillity overlooking a pure green valley with vineyards, river and swathes of sunflowers. This is a smart villa built in traditional style, constructed from 100% local materials and enviably eco: solar panels for hot water and underfloor heating, a heat-exchanger to keep rooms blissfully cool in summer and ionized water for the fully-fenced pool. The charming owners live above your ground-floor apartment but the pool and outdoor eating space are all yours. White walls, terracotta tiles and practical furniture make for easy-living; top that off with comfortable bedrooms and a neat kitchen and you’ve got all you need for a relaxed stay. Zip off to the sea, quaint Pedaso is closest, the Frasassi Caves are a must, or visit Ascoli Piceno, a half-hour drive: it’s one of Italy’s loveliest cities. Roberto is happy to show you around the land and share his knowledge, vines are a stroll away, and the vineyard views may inspire you to arrange a tasting at the award-winning winery nearby. Minimum stay: 3 nights; 7 nights in high season. Villa in the Vineyard was all we wished it to be & more! Roberto & Nikki were extremely attentive & made us feel very welcome/at home. They know the local area well, recommending restaurants & places to drink – all very nice. The Villa is in an amazing setting, lying by the swimming pool you view their vineyard and surrounding hills. So relaxing with lots of peace and quiet. Accommodation is very comfortable with lots of windows + super lounge. Great location to explore Italian villages - narrow, cobbled streets & beautiful buildings. We're living on the memories & will book again! 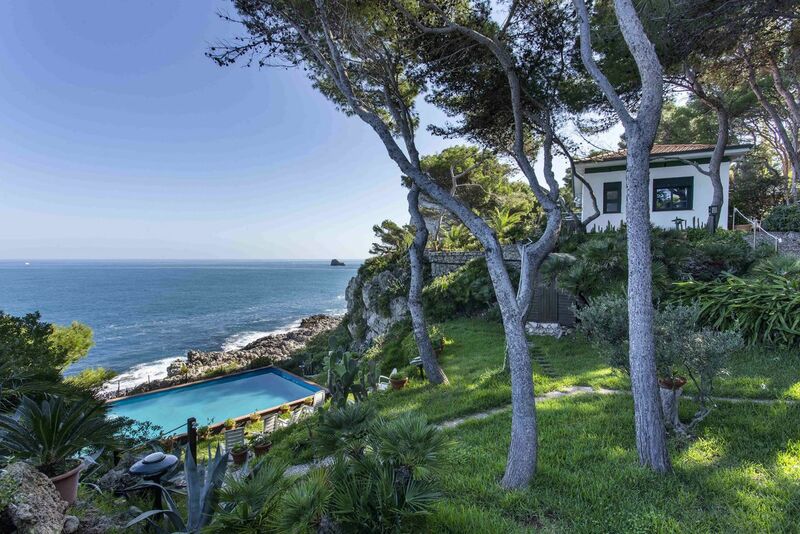 The Villa is amazing with wonderful views and lots of local places to visit. Bob and Nikki were very helpful and knowledgeable about the local area. They gave us a lovely welcome pack which gave us a perfect start to our holiday. The beds were very comfortable and the villa itself although fairly modern still retained its rustic looks and is fully fitted out to make our stay very comfortable. Lovely for walking with incredible views We look forward to returning very soon. We stayed with our two young children at the end of August and had a really wonderful time. The setting is incredibly beautiful and the villa was immaculate. Roberto and Nikki were great hosts - very generous with their time (and vegetable garden produce!) but also giving you space to enjoy your holiday. Lazy days were spent in the beautiful garden and swimming pool, with visits to the wonderful Ascoli Piceno, Servigliano and the next door neighbour's vineyard a must. A great option if you have children - lots of gear and toys were provided and the garden is perfect. We had a delightful time in the villa, which really is in the middle of a vineyard. Beyond that you're surrounded by beautiful hills, each with its own character and use. The place was really comfortable with everything we needed for sleeping, relaxing and cooking. The pool was the nicest one we've ever used. The welcome was really warm and Roberto and Nicki were generous with their time and knowledge. There's lots to do in the area but days spent around the villa were also really enjoyable. It's the first year of the garden but we enjoyed delicious fresh vegatables throughout the week. My partner, my two kids (11 and 16) and myself had a wonderful stay with Bob and Nikki. The view from the villa is stunning, the surrounding landscape is some of the best in the area, local farming with such a variety of fruits and veg. A great tennis court for free in the local village on top of the hill with the best views across the valleys. I thoroughly recommend it! This was my 9th year of returning to this amazing villa with the most stunning scenery and tranquil setting. The villa is set in the most wonderful area in Montelparo with fascinating towns and villages to explore. Beaches and mountains just 30 minutes away.There are a wide variety of local restaurants to chose from , serving authentic regional dishes including the local wines. We visited some amazing towns with some wonderful history mixed in with some beautiful local products made in this region. We also enjoyed some gorgeous days relaxing by the stunning pool with beautiful views. This was our 9 year on returning to this wonderful apartment , this year we had new owners Nikki and Roberto and we must say they gave us such a warm welcome back and to us it always feels like home. The garden Roberto has worked hard on to such a high quality with his gorgeous home grown vegetables which was supplied to us fresh each day with courgette, figs , pears and a lovely spaghetti squash. Nikki has used her homely skills and supplied wonderful organic toiletries and beautiful bed linen with gorgeous soft towels. The local wine tasting is a must which is grown on the villas vineyard. I had a wonderful stay at this beautiful villa, set in the most amazing grounds with the best views and scenery. It is very remote, so a car definitely needed for the windy roads, but utterly picturesque! It was a very clean and modern space, and the pool was the perfect size to go for a dip and admire the views. There is also a pizza oven in the garden, which made a great dinner one of the nights. The hosts are brilliant and very welcoming, with plenty of advice to give about the area, as there are many little towns around to explore and enjoy. Would highly recommend! We recently stayed at the Villa in the Vineyard on our honeymoon, along with our 12 month old daughter. The hosts really could not do enough for us. We were provided with a welcome pack which included sparkling wine, cereal, bread, fruit and milk; we had a brand new cot, high chair and paddling pool for our daughter; The hosts were always on hand with handy travel tips for excursions; we were even invited into their apartment one evening for homemade stone baked pizza! To top things off the property and location were wonderful which made for an unforgettable honeymoon! Villa in the Vineyard is situated in a breathtaking mountainous location which is close to authentic Italian towns and to the coast. Waking up to sunshine and amazing views was what made my stay- it's a great place to relax and clear your head! The facilities inside the villa were excellent and it was great to be provided with local wine from the vineyard, fresh bread and vegetables from the host's vegetable garden. We especially loved visiting Ascoli Piceno and spending a day on the beach at San Benedetto. The hosts were very friendly and gave us great recommendations- definitely returning! The monthly antique market in the city of Ascoli Piceno, with paintings, antiques and memorabilia through the decades. Take a coffee at Cafe Meletti in the Piazza del Popolo, stroll around the stalls and soak up the Italian atmosphere. Have a walk up the road to our neighbours who manage the vineyards and produce excellent DOC wines. We can arrange a wine tasting visit for you in their winery. Have an afternoon snooze in a hammock in the shade of the olives trees at the villa. Take a stroll around our beautiful garden or surrounding vineyards, 19 acres in total, and be amazed at our stunning views across fields of sunflowers and orchards, up to the medieval hilltop towns and views to the snow-capped Sibillini mountains. Servigliano is one of our favourite towns with its arched entrances, historic piazza and smart cafes/gelaterias. Buy fresh food from the artisan producers - salami, prosciutto, fresh pasta, local wine and the famous Ascoli stuffed olives. Enjoy al fresco! Forty minutes to the Sibillini Mountains National Park with its stunning mountain range, waterfalls, and rivers. This is a perfect place for walking, hiking, horse riding, mountain biking or wild swimming in the lakes - great for a hot summer day. The golden beaches of the Adriatic with its blue flags are also 30 mins away. A visit to Conero is a must with its stunning coastline and clear waters. Sit outside at a beachside restaurant and eat the freshest fish and seafood with a chilled local wine.